Every year, about 30 billion metric tons of carbon dioxide are pumped into the Earth’s atmosphere from power plants, cars and other industrial sources that rely on fossil fuels. Scientists who want to mitigate carbon dioxide’s effects on global climate have started experimenting with storing the gas underground, a process known as carbon sequestration. However, there are still many unknowns surrounding the safety and effectiveness of that strategy. MIT engineer Angela Belcher is now taking a new approach that would not only remove carbon dioxide from the environment, but also turn it into something useful: solid carbonates that could be used for building construction. “We want to capture carbon dioxide and not put it underground, but turn it into something that will be stable for hundreds of thousands of years,” says Belcher, the W.M. Keck Professor of Energy. 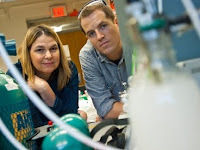 By genetically engineering ordinary baker’s yeast, Belcher and two of her graduate students, Roberto Barbero and Elizabeth Wood, have created a process that can convert carbon dioxide into carbonates that could be used as building materials. Their process, which has been tested in the lab, can produce about two pounds of carbonate for every pound of carbon dioxide captured. Next, they hope to scale up the process so it could be used in a power plant or industrial factory. Funded by the Italian energy company Eni, the new MIT process for turning carbon dioxide into carbonates requires two steps. The first step is capturing carbon dioxide in water. Second, the dissolved carbon dioxide is combined with mineral ions to form solid carbonates. Yeast don’t normally do any of those reactions on their own, so Belcher and her students had to engineer them to express genes found in organisms such as the abalone. Those genes code for enzymes and other proteins that help move carbon dioxide through the mineralization process. The researchers also used computer modeling and other methods to identify novel proteins that can aid in the mineralization process. Some companies have commercialized a process that captures carbon dioxide and converts it to solid material, but those efforts rely on a chemical process to capture carbon dioxide. The MIT team’s biological system captures carbon dioxide at a higher rate, says Barbero. Another advantage of the biological system is that it requires no heating or cooling, and no toxic chemicals. Next, the team plans to try scaling up the process to handle the huge volumes of carbon dioxide produced at fossil-fuel-burning power plants. If the process is successfully industrialized, a potential source for the mineral ions needed for the reaction could be the briny water produced as a byproduct of desalination, says Barbero.